We will be closed on November 22nd and 23rd for Thanksgiving. We will reopen November 26 at regular business hours. If you are experiencing an emergency please call 911. We will be closing at 12:00pm on December 24st, 2018 for Christmas Eve. We will reopen December 26 at regular business hours. If you are experiencing an emergency please call 911. We will be closed on December 25th, 2018 for Christmas Day. We will reopen tomorrow at regular business hours. If you are experiencing an emergency please call 911. We will be closing at 12:00pm on December 31st, 2018 for New Years Eve. We will reopen January 2nd at regular business hours. If you are experiencing an emergency please call 911. We will be closed on January 1st, 2019 for New Years Day. We will reopen tomorrow at regular business hours. If you are experiencing an emergency please call 911. We will be closed on February 18th, 2019 for President's Day. We will reopen tomorrow at regular business hours. If you are experiencing an emergency please call 911. We will be closed on May 27, 2019 for Memorial Day. We will reopen tomorrow at regular business hours. If you are experiencing an emergency please call 911. We will be closed on July 4th, 2019 for Independence Day. We will reopen tomorrow at regular business hours. If you are experiencing an emergency please call 911. We will be closed on August 12th, 2019 for Victory Day.We will reopen tomorrow at regular business hours. If you are experiencing an emergency please call 911. We will be closed on September 2nd, 2019 for Labor Day. We will reopen tomorrow at regular business hours. If you are experiencing an emergency please call 911. We will be closed on October 14th, 2019 for Columbus Day. We will reopen tomorrow at regular business hours. If you are experiencing an emergency please call 911. Do you Need an Appointment? We have made it easier to schedule appointments, click the button to fill out an online appointment request form or call our new central scheduling line 401-457-1500 to schedule an appointment. Have back or neck pain? Learn what causes symptoms and the home remedies that relieve pain. University Orthopedics mails out Home Remedy Books to residents throughout the New England area. Subscribe to our Back to Life Journal to read information on the latest advances on joint replacement, sports medicine, orthopedic problems and back and neck pain. View illustrations that show various conditions and learn about what may be causing pain. Learn about various exercises that play a key part in the recovery and rehabilitation process. 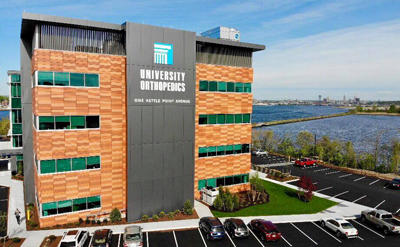 University Orthopedics in Providence, Rhode Island, is a regional referral center for patients with back and neck pain, joint pain, sports medicine problems, shoulder pain, hand problems, hip and knee pain, and foot and ankle injury. University Orthopedics utilizes fellowship-trained, sub-specialized physicians to treat a variety of orthopedic problems. Learn more. Developing Centers of Excellence for Better Healthcare.